A rope of drool unspooled from my mouth when I opened Jabba's Realm, the latest expansion for Star Wars Imperial Assault. I knew it contained the Rancor, the reptilian monster from Return of the Jedi, and I knew that the Rancor miniature would be big. But it had never occurred to me that it would be so big. And so beautifully sculpted. Before starting to paint it, I studied the stills from Return of the Jedi in order to find the right approach. 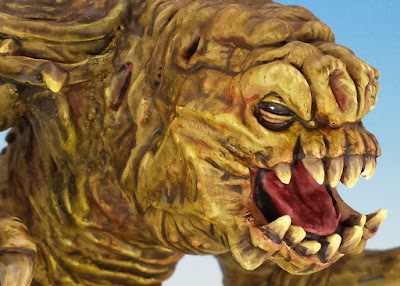 At first glance, the Rancor Monster is one ugly mass of brown. This can make for a very boring paint job. But if you look closely at the photos from the film, you see that there is a lot of subtle and seemingly random variegation within the brown hide: splotches of red, green and burnt sienna. These discolorations are what gives the Rancor a sense of life. First came a basecoat of light green-brown using Vallejo acrylics. The back plates and bone spurs got a different basecoat of khaki brown. I applied a couple washes of GW's Agrax Earthshade (mixed with green ink) to the whole surface, and then layered darker washes with recessed areas to increase the sense of shading. I applied touch ups to remove blotchiness, and to begin colouring in the mouth. 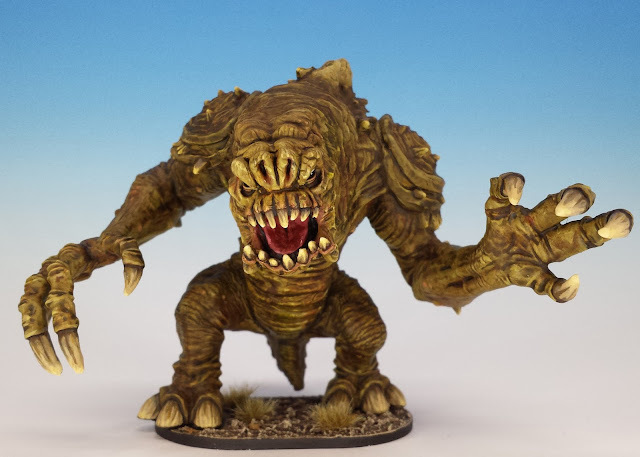 To add that oily quality that the original Rancor has, I added a layer of Army Painter's Quick Shade "Strong" to most of the model, paying special attention to back and shoulders. Fun with oils. Using very small amounts, I would apply random patches of green, red, pink, purple and brown paint, and then blend it into the surrounding flesh by diluting it with mineral spirit (aka white spirit) and pushing it around the model. 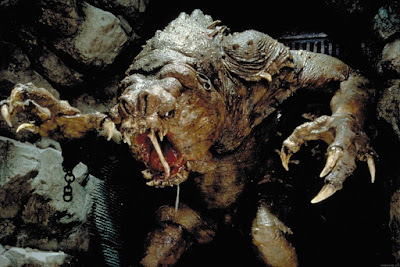 Red and pink were especially effective when applied on the edges of the Rancor's gums, eyes and nostrils. More touch ups to the hide in order to ensure that the discolorations looked smooth. Final details, mainly the eyes and highlighting the claws and teeth with increasingly whiter shades of bone. I was happy with the sense of depth created by the combination of oils, inks and washes. The whole package turned out slightly greener than I had originally intended, but I guess the alchemical process took on a life of its own. He's got a face only a mother could love. Fantastic work. It looks horribly marvelous. Awesome painting! Feel the EpVI spirit! I'm glad it seems like a captured some of the SW flavour. That is impressive! The model is great but you've really brought it to life with your palette, especially those little oil glazes of warmth you've added. I must try that one day..
Once I started using oils, I was amazed at how easy they are to use. Pretty sweet. Someone else was also showing how well the models scale with Rogue Trader figures the other day. They scale quite well, especially monsters like the Rancor. 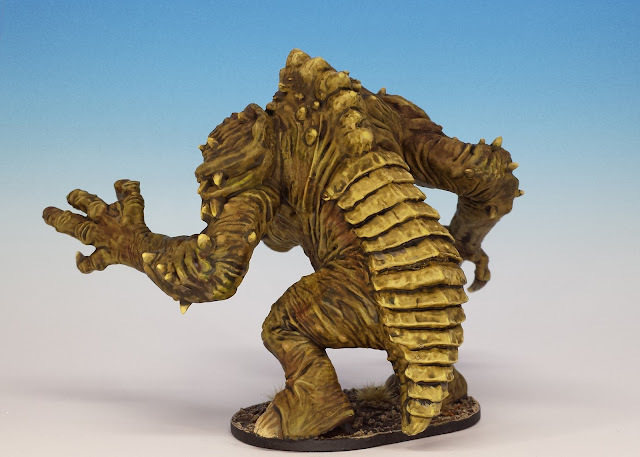 The human figures betray the scale creep that you find across the whole hobby, so that their scale is probably about 30 or 33mm rather than 25mm or 28mm. I noticed that you varnished with a matte before applying the oils. I've always been told (and always thought) that you were supposed to apply a gloss, because it's a lot thicker & harder than a matte. It resists the white spirit better than a matte. Could you please tell me your reasoning as to why you decided to use matte instead Matthew? Great question with a dumb answer. I didn't have any gloss varnish on hand because I almost never use it. I didn't notice the white spirit eroding the matte or the paint underneath in this situation, but perhaps I was using pretty small amounts. Yeah, if you only apply small amounts it wouldn't make much of a difference I'd imagine. When I filthify my vehicles/robots with oils I'm always mindful of applying too much white spirit to the same area too often. Oh I do like this. Lovely job. Awesome!! Great work. Looks e vil and hungry. I can't wait to see how he plays in the game. Astonishing. The colours, the transitions, all you did here really shows the true impression of being a live monster. Where I couldn't have got more than the mass of brown you made an outstanding job! Congrats! It is a she, isn't it? How do we know? Holy jedi balls that's flippin fantastic mate! 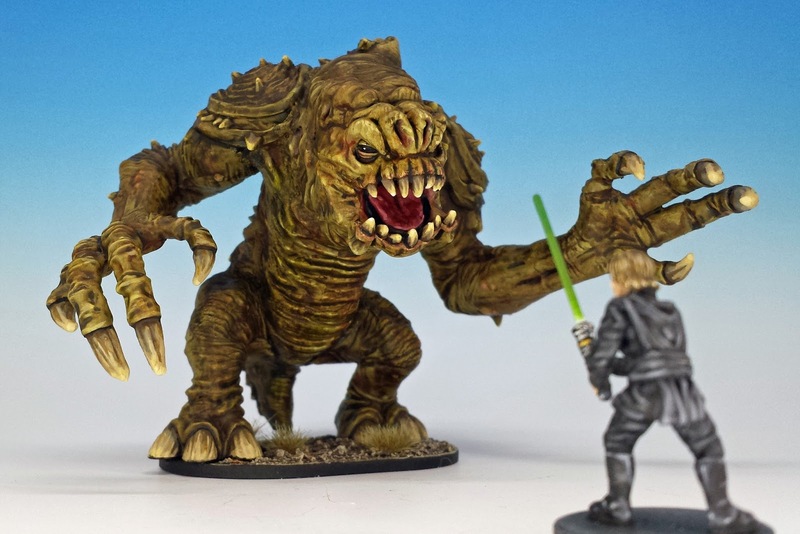 RotJ is my fav of all the SW flicks and I think I will have to pick up that set purely for the Rancor alone after seeing your version. The thing that makes me so happy about this Rancor is how big it is. It gives it a truly terrible presence on the table. Wow, that is incredible. Great work!